Bratislava Castle and St. Martin's Cathedral as seen from the Danube River. The National Council is to the left of the castle, and the Slovak National Gallery is in front of St. Martin’s Cathedral. Bratislava derived its name from a Czech ruler, but the current form of the name implies “the city of brotherly love,” that is, Philadelphia. Although it is the capital of Slovakia, Bratislava never was a world city, like Budapest or Vienna, which also lie on the banks of the Danube River. Since Slovak independence in 1993, however, Bratislava is becoming ever more cosmopolitan. Its location at a strategic point on the Danube made Bratislava important, even in prehistoric times. There was a Celtic settlement on what is now the city limits, and it became the the location of Devín Castle that dates from 864 has been in ruins since 1809, when Napoleon Bonaparte (1769-1821) ordered it destroyed. After the Turkish conquest of Hungary that started with the Battle of Mohács in 1526, Bratislava, known as Pozsony in Hungarian and Preßburg in German, served as the capital of rump Hungary under the Habsburgs between 1536 and 1873, when the capital became Budaest (Buda and Pest only united in 1873). Even after Bratislava was no longer the location of the coronation of Hungarian kings and the seat of the Hungarian archbishop, the city remained largely Hungarian and German in character, but it lacked the investment that capital cities normally received. Based on the 1910 census, the Slovaks in the city were a minority of about 15 percent, while Germans and Hungarians, roughly equal in number, with the Germans having a slight edge, comprised about 82 percent of the population. After the First World War, Bratislava became the administrative capital of Slovakia, and the number of Czechs and Slovaks in the city grew, and Slovaks were the dominant ethnic group by 1938 and the end of the First Republic. Because the city is relatively compact, it is possible to see a number of historic buildings with ease. Touring interiors and museums, of course, require additional time. A few major points of interest appear below, beginning with sights on the banks of the Danube. SNP Bridge (Most SNP) -- The Most Slovenského národného povstania (Most SNP) or Bridge of the Slovak National Uprising, derives its name from the revolt that began in 1944 against the pro-Nazi regime in Slovakia and lasted until the end of the Second World War. Between 1993 and 2012, the bridge was known as the Nový Most (New Bridge). Built between 1967 and 1972, the bridge improved traffic flow from Petržalka, Bratislava’s residential suburb on the right bank of the Danube, but at an expense. It required the demolition of a landmark synagogue and the Jewish quarter, and its approach on the Bratislava side is directly in front of St. Martin’s Cathedral. Those concerns were minor and even causes to celebrate for the atheistic Communist urban planners and politicians. The bridge is the world's longest cable-stayed bridge, asymmetrically designed with one pylon comprised of two pillars and one cable-stayed plane made of two steel wire-rope cables. On the top of the pylon, which is nearly 85 meters high, is the restaurant UFO (officially UFO watch.taste.groove--more information at http://www.u-f-o.sk/) that boasts of a view of 100 kilometers (60 miles). The Slovak National Gallery (Slovenská národná galéria) -- This museum of art is relatively new, dating from 1948, and is located in a Baroque building that was reconstructed between 1969 and 1977 in the Socialist Realist style. The collection includes Gothic and Baroque art, and it has some works by Pablo Picasso (1881-1973) and Andy Warhol (1928-1987), who was of Rusyn ethnic origin. The web page for the museum is http://www.sng.sk/en/uvod. Slovak National Museum (Slovenské národné múzeum) -- On the banks of the Danube, the SNM main building houses the natural history collection, but there are 17 other buildings in the system, including the archaeological museum, the historical museum located in the Bratislava Castle, and three additional buildings devoted to Jewish, Hungarian, and Carpathian German cultures. Additional museums are located in other cities. The web site for the museum is http://www.snm.sk/?home. Reduta -- Built in 1773 as a granary, Reduta was adapted into a multipurpose hall between 1913 and 1919, a time when it received its current facade. It served several purposes, and after the Second World War, it became the permanent home of the Slovak Philharmonic. In 2012 it completed a major renovation, which included the replacement of the four-manual, 85-rank, Rieger-Kloss organ, which dated from the 1950s and which had some technical difficulties, with a new instrument from the Austrian company Rieger Orgelbau. The new three-manual organ has 66 ranks (the specifications are at http://www.rieger-orgelbau.com/details/project/Bratisl/). The web site of the Slovak Philharmonic is http://www.filharm.sk/. Main Square (Hlavné námestie) -- The Main Square is the center of Bratislava. The center focus is the Roland Fountain (Rolandova fontána), which in 1572 the Habsburg king of Hungary, Maximilian II (1527-1576; reigned, 1563-1576), commissioned. Near the fountain are the Neo-Renaissance Hungarian Discount and Exchange Bank (Uhorská eskontná a zmenárenská banka). To the right of the bank is the Neo-Renaissance Palugyayov palác, the work of the Bratislava-born architect Viktor Rumpelmayer (1830-1885), who also built the Royal Palace (now the National Art Gallery) in Sofia, Bulgaria, and the German Embassy in Vienna. See also the Old Town Hall below. Old Town Hall (Stará radnica) -- The tower of the Old Town Hall on the Main Square dates from the 1370s, and the building is one of the oldest in Bratislava. It is now the City Museum of Bratislava. Look for the cannon ball embedded in the facade. It actually dates from the Napoleonic Wars, specifically 1809, when Napoleon’s troops bombarded Bratislava and destroyed Devín. The web site of the City Museum of Bratislava, which has several branch museums, is www.muzeum.bratislava.sk/en/. Primate’s Palace (Primaciálny palác) -- A few hundred yards east of the Main Square is the Primate’s Palace, which was built in 1778-1781 in the Classical style. The Fourth Peace of Pressburg, a treaty that ended the War of the Third Coalition during the Napoleonic Wars, was signed in 1805 in the palace’s Hall of Mirrors. As a result of the peace, Austria lost a good deal of territory. The palace is now a museum, but the city council holds its meetings in the Hall of Mirrors. Michael’s Gate (Michalská brána) -- This is the only remaining gate from the four original gates of the old city fortifications. It dates from the fourteenth century and was reconstructed in the sixteenth century. The copper roof dates from the seventeenth century. Its last major reconstruction was in 1753-1758. Archbishop’s Summer Palace (Letný arcibiskupský palác) -- The former Renaissance summer residence of the Archbishop of Esztergom, Hungary, is now the seat of the Slovak government. It is located to the north of Grasalkovičov Palace, but it is not open to the public. Cathedral of St. Martin (Katedrála svätého Martina) -- This Gothic church was established early in the fourteenth century, on the location of an earlier church, and it took two centuries to complete, even though in 1452 it was consecrated. Over the years, it grew in size. Later it received a Baroque facade, and in the nineteenth century workers restored its Gothic character. From 1563 to 1830, 11 Hungarian monarchs, including Maria Theresa (reigned 1740-1789) were crowned at St. Martin. In 1847, the cathedral received its Hungarian crown, with the tilted cross, resting on a pillow atop a reconstructed steeple. In the interior of the church is the Baroque Chapel of St. John the Almsgiver (Kaplnka svätého Jána Almužníka), which includes the remains of the revered seventh-century patriarch of Alexandria. The chapel was the work of the famous Austrian sculptor Georg Rafael Donner (1693-1741), who also was responsible for the equestrian statue of St. Martin in the church. The web site for the cathedral is http://dom.fara.sk//. Bratislava Castle (Bratislavský hrad) -- The castle was an important location from prehistoric times, and the first stone structure appeared on the site in the tenth century. In the seventeenth century, it received its current Baroque appearance. It was the castle of the Habsburg kings of Hungary after the Battle of Mohács in 1526 when Budapest and most of Hungary fell to the Turks. Beginning in 1552, it housed the crown jewels of Hungary, but in 1784, Joseph II (1741-1790; reigned 1780-1790) removed them to the treasury in Vienna. In 1811, the castle burned, and it was not reconstructed until after the Second World War. The castle houses the historical exhibitions of the Slovak National Museum, but it also has presentation rooms for the National Council and the Slovak president. National Council (Národná rada) -- The main building of the National Council, the unicameral legislature of Slovakia, is located in the Socialist Realist building near the Bratislava Castle. Tram Tunnel (Tramvajový tunel) and the Chatam Sofer Memorial (Mauzóleum Chatama Sofera) -- Building the tram tunnel under the castle was a project the Slovak First Republic began in 1941, during the Second World War; in 1949, the 792-meter-long structure was complete. To construct the tunnel, the authorities confiscated and eliminated a Jewish cemetery, something the anti-Semitic regime at the time considered progressive. Either because of international pressure, a hefty bribe, or fear of a curse, the authorities protected a section of the cemetery reserved for rabbis using a concrete structure beneath the approach to the tunnel. The construction of a new memorial that involved moving the tram tracks was complete in 2002, and the public now has better access to the 23 remaining graves. The most famous grave is that of Chatam Sófer (born Moše Schreiber, 1762-1839), an orthodox teacher who opposed the Jewish reform movement of his day and established the respected Bratislava yeshiva to study the Talmud and Torah. The cemetery now is a UNESCO World Heritage site. Tours are by appointment 48 hours in advance. Information is available at http://www.chatamsofer.sk/. For more information on Jewish culture in Slovakia, see http://www.slovak-jewish-heritage.org/. Kamenné námestie -- There are several buildings of note near the square known as Kamenné nám. The Tesco dates from 1967. On Špitálska ul. is the Church of St. Lawrence (Kostol svätého Ladislava), which existed in the fourteenth century but took on a simple Classical style in its 1830-1832 reconstruction. The Church and Convent of St. Elisabeth (Kostol a kláštor Alžbetínok) in the Baroque style (notice the elaborate domed tower) was the work between 1739 and 1745 of František A. Pilgram (1699-1761). Comenius University (Univerzita Komenského) -- Although Komenský University was established in 1919, after the creation of Czechoslovakia, it was not the first university in Bratislava. Before, the Hungarians had the Elisabeth University, which the Czechoslovak authorities disbanded after the First World War and the Hungarians reestablished as the University of Pécs. An even older university existed from 1465 to 1491 known as Universitas Istropolitana, after the Greek name for Bratislava (the Latin name of the city was Posonium). The main building of Komenský University, a structure in the Functionalist style dating from 1937, is east of the city center. Church of St. Elizabeth (Kostol svätej Alžbety), also known as the Blue Church (Modrý kostol), the work of the Hungarian architect Ödön Lechner (1845-1914). Church of St. Elizabeth (Kostol svätej Alžbety) -- Dedicated to St. Elizabeth of Hungary (1207-1231), a princess who became a nun and gave her money to the poor after she had become a widow, this church also is known as the Blue Church (Modrý kostol) because of its blue exterior color. 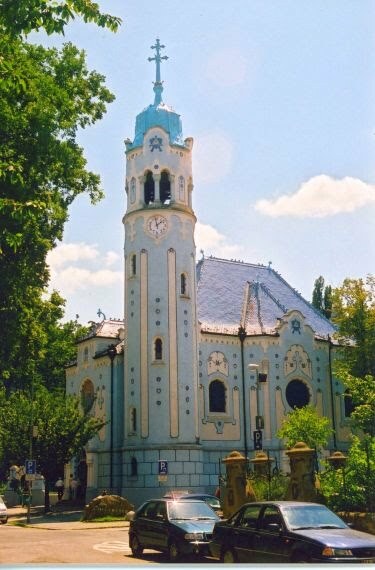 In 1907-1908, the noted Hungarian architect Ödön Lechner (1845-1914) built the church as well as its parish house and high school on Bezručova ulica (Bezručova Street) in the Secessionist style. If architecture, according to the Roman architect Vitruvius (born c. 80-70 BC and died after c. 15 BC), is to delight, this church serves as a perfect example. The web site for the church is http://modrykostol.fara.sk/?page=uvod (in Slovak). Slovak Radio Building (Budova Slovenského rozhlasu) -- The inverted steel pyramid that houses Slovak Radio was completed in 1984 and is a Socialist Realist structure, even though it departs from the boxy appearance that characterizes the style. Its architects were the Slovaks Štefan Svetko (1926-2009), Štefan Ďurkovič (born 1929), and Barnabáš Kissling (born 1925). Botanical Gardens and Zoo -- The Botanical Gardens of Komenský University (Botanická záhrada UK), established in 1942, are along the Danube River in the eastern part of the city. The web site for the gardens is http://www.uniba.sk/index.php?id=bz. The nearly-100-acre Bratislava Zoo (Zoo Bratislava) is also in the eastern part of the city but some distance to the north of the Botanical Gardens. Its web site (only in Slovak) is http://www.zoobratislava.sk/. Slavín -- Opened in 1960 on a hill overlooking Bratislava, Slavín is the monument to the Red Army’s liberation of Slovakia during the Second World War. There are 6,845 Soviet soldiers interred at Slavín in six mass graves and 278 individual graves. The view of the city from Slavín is spectacular. Devín Castle -- Dating from the ninth century, Devín was an important fortress with a commanding view of the Danube and Morava River. As Napoleon withdrew his forces in 1809, he blew up the castle. The small turret that is precariously poised on a rocky cliff is one of the historic symbols of Slovakia. The ruins are partially restored, and the site, aside from the museum, is accessible all day. Bus 28 or 29 runs from the center of Bratislava to the Devín section of the city, and the castle is a short walk from the last stop. Devín is part of the City Museum of Bratislava (see The City Center above). With any time remaining, the visitor may want to sample Slovak cuisine or relax in a café. Especially charming is to dine or enjoy a glass of wine or a cup of coffee in a boat restaurant on the Danube.